Wolf's Mission is Now Available for Kindle! Eli and Nate must do everything in their power to rescue the girl and defuse the situation. Will they be in time to prevent the human/were war the Huntsmen are attempting to start? Or is the future drenched in the blood of innocent humans and werewolves? Wolf's Mission, the third novella in the Texas Ranch Wolf Pack Series, is now available in ebook on Kindle and will soon be available in paperback! Kindle Unlimited subscribers can read FREE as part of their subscription service. UPDATE: The paperback edition is available now! Click here to read the first two chapters free! P.S. 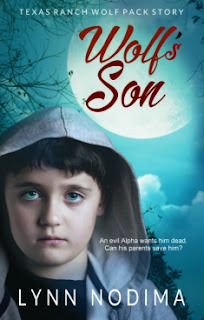 Don't forget to opt-in to my mailing list to get your FREE copy of Wolf's Son!